You can click the pics here to make 'em even bigger for a detailed look. 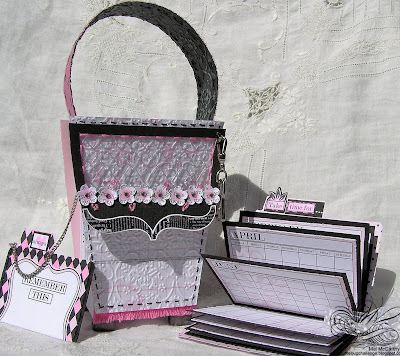 I got to play with the gorgeous Journal It Girl collection from Teresa Collins Designs. There are unlimited possibilities with this trend-setting kit. (I love all the stationery elements madly!) I used it to make this gift set: a purse box, with a little pocket tag (as a wallet on a chain), and a pocket calendar book. For the handle:Core'dinations Whitewash cardstock (black piece), pink fabric & fabric glue, white craft ink. 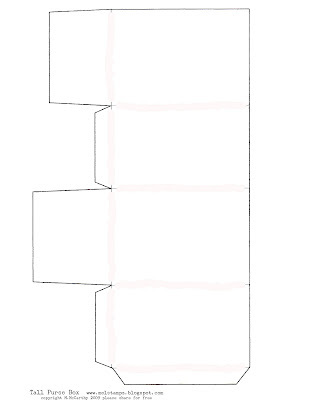 1A) Print & cut out the template for the purse box base. 1B) Trace the box template onto the Journal It Girl double sided paper (I used the Pink Ledger paper TC-6140 .) Cut the box out & score it. 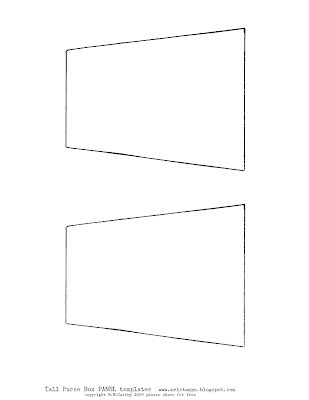 The template is designed to fit exactly 2 boxes per 12x12 sheet of paper. Step 2} Make the panels for the front & back: Print & cut out the purse panel templates & trace them onto the largest of the Journal It Girl die cut file folders. Cut them out. -->Ink a cuttlebug folder with Versamark (or other clear embossing ink)-on the negative or positive side, whichever you prefer. -->Run the 2 purse pieces (for front & back) through the Cuttlebug in the inked folder. -->After you Cuttlebug emboss the panels, sprinkle clear embossing powder on the wet Versamark. -->heat set the embossing powder with a heat gun. 3B) Embellish the panels: Pierce & stitch around the edges. 3C) Enforce the panels by adhering them to cardstock & cutting them out. To make the fringe I just snipped lots of pieces of embroidery thread (about an inch long each); then, added them side by each to a strip of really sticky double-sided tape on the purse panel back. You don't have to worry about getting them straight at all: really sharp scissors are great for cutting them in a nice straight line. 4A) Make an acetate piece for the flap by tracing the purse front with a permanent marker onto acetate & cut it out. 4C) Cuttlebug emboss the acetate piece, adhere the frame & stitch around the outside. 5B) Emboss it, ink the black side with white ink & stitch it with black thread. Step 6} To assemble the whole thing: Adhere the panels to the purse box base & attach the handle. C) Cut 4 pieces of black cardstock (each piece measuring 3-3/4" x 5-1/2") Score them each down the middle & fold them in half. Lay them over each other, pierce them down the middle & stitch or adhere them into the File folder to make a book. D) Adhere the calendar months & embellish the pocket book with pieces from the Journal It Girl Collection. E) If it's tied shut with a ribbon, it fits perfectly in the purse box. (or click the photos below & select "save as"
P.S. I just have to mention again that it was such a delight to post along side Terrie who made the most stunning album! You can see it in all it's glory on her blog here & she was featured on Teresa Collins blog too! Nathalia has posted some projects today on the Cuttlebug Challenge Blog that will also take your breath away! WOWZERS!!!!!!!!!!!!!!!!! This is amazing! I love it all! Wow! Absolutely amazing project, Mel!!! Thank you so much for sharing template and how you made it!!! Thank you! Your blog post will be advertised on the DigiFree Digital Scrapbooking Freebie search engine today (look for timestamp: 01 Sep [LA 07:00pm, NY 09:00pm] - 02 Sep [UK 02:00am, OZ 12:00pm] ). Wow this is soooo beautiful ! How did I miss to leave a comment here!!!!? demo`s and creations you bring us..